• 65 percent of U.S. copper production is from Arizona mines. • Copper had a $4.87 billion impact on Arizona’s economy in 2012. • Copper mining was responsible for 51,200 Arizona jobs – 11,800 direct and 34,400 indirect – in 2012. What started as a class project by an Oro Valley school students and could wind up making copper an official state symbol. Arizona already has a state gemstone (turquoise) and state fossil (petrified wood), but Jennifer Royer, a teacher at Copper Creek Elementary, has been working with students for three years to promote a place for copper as state metal. They approached their state senator, Republican Steve Smith of Maricopa. The result: Smith’s SB 1441, which has passed the Senate and won unanimous approval Thursday from the House Government and Higher Education Committee. Royer wasn’t on hand Thursday, but on Feb. 9 she and many of her students addressed the Senate Natural Resources Committee. “It began as a simple class discussion as students were researching Arizona state symbols,” Royer said. “Through their research, they discovered that other states in our union have adopted symbols such as a donut in Louisiana and even a fiddle in South Dakota. Coleman Anderson, a student, used numbers to back up his argument for copper. Zackery Harris, another student, said Arizona needs to address this gap in its state symbols. According to the Arizona Miners Association, 65 percent of U.S. copper production comes from Arizona mines and copper mining had a $4.87 billion impact on Arizona’s economy in 2012. Kelly Norton, president of the Arizona Mining Association, said the bill is definitely something her organization supports. John Kemeny, a professor with the College Engineering Department of Mining and Geological Engineering at University of Arizona, said it’s a great idea to make copper a state symbol as it’s already a big part of the state and even included in the state flag. 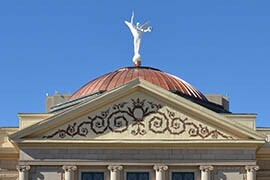 Arizona has an official bird, flower and even state gun. Now the state is one step closer to having a new symbol: copper as the official state metal. 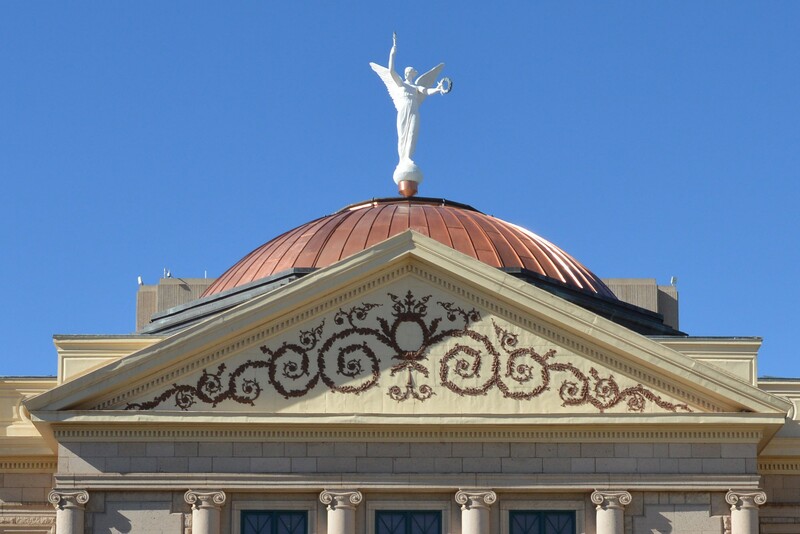 The copper dome atop the Arizona State Capitol is one sign of the metal’s importance in Arizona history. A bill before the Legislature would make copper the official state metal.